This morning was off to a rough start after waking up to snow… UGH! It just doesn’t want to warm up yet. I’m craving sun and warm weather so bad!!! Even our Florida vacation a couple weeks ago was cold… I’ve officially been frozen since November and this girl is over it. The only positive is extra snuggles in bed with Taz as he lives under our covers all winter long 🙂 Oh and lots of my de-bloat tea that I make every afternoon to warm up. 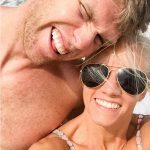 I hope you guys live in a warmer, sunnier place! Now onto some good eats. It’s a miracle I remembered to snap pics of everything I ate yesterday. As pictured above, I’m back on my Mermaid Lemonade train! 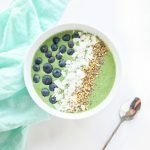 This time, with liquid chlorophyll instead of powdered spirulina which makes a lot more sense. 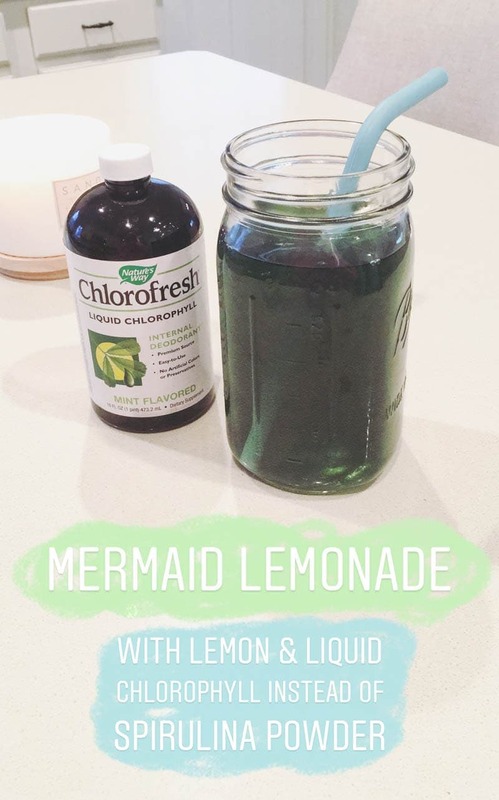 So many of you commented about your lemonade getting clumpy and the trick is to use room temperature (or even warm) water while whisking in the spirulina powder, then you add the other ingredients, then you add ice if you feel like it! But using a liquid form of something green eliminates the clumping issue altogether. Chlorophyll is a plant pigment that detoxifies the body, cleanses the liver and helps wounds heal faster. The brand I bought does not taste “green” whatsoever, but is naturally flavored with mint which adds a nice touch. Plus I feel super healthy drinking green water ha! It’s just something fun to add into your healthy lifestyle that also happens to be detoxifying. Breakfast was extra satisfying. 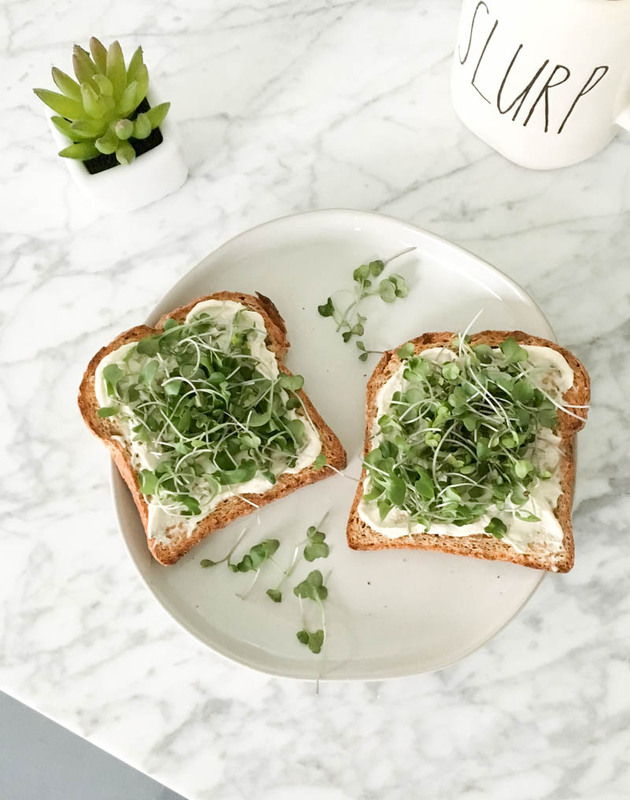 Two pieces of sprouted grain toast with Kite Hill’s newest vegan cream cheese flavor – jalapeño! I love it. Topped with microgreens which are so easy to add on top of anything, for extra nutrition and green goodness. Plus one cup of coffee! Still debating whether or not I need to quit coffee for good. Also not sure why I add cream cheese to toast but probably because I never buy bagels… I’m weird. Lunch was leftover spicy vegetable stir fry with tempeh and edamame, and a huge side of fresh spinach! Then I had two afternoon snacks! 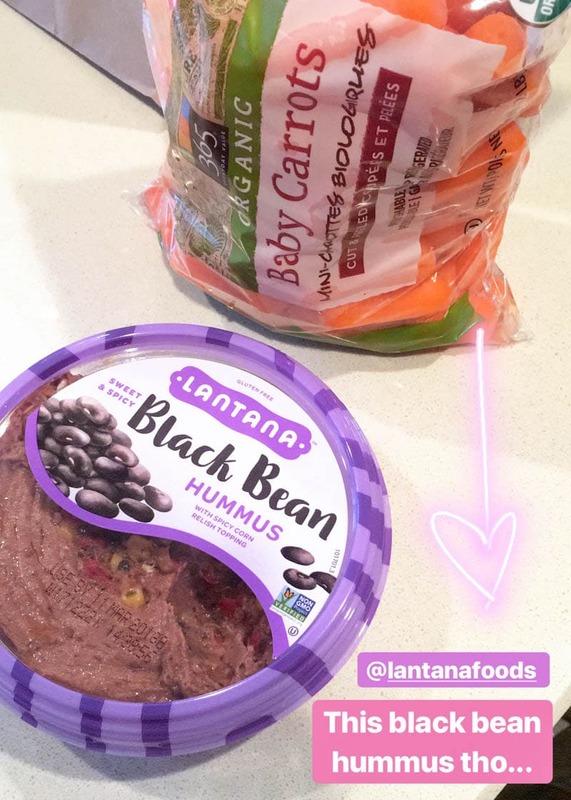 First up, this uh-mazing black bean hummus with baby carrots. This hummus is seriously addicting. 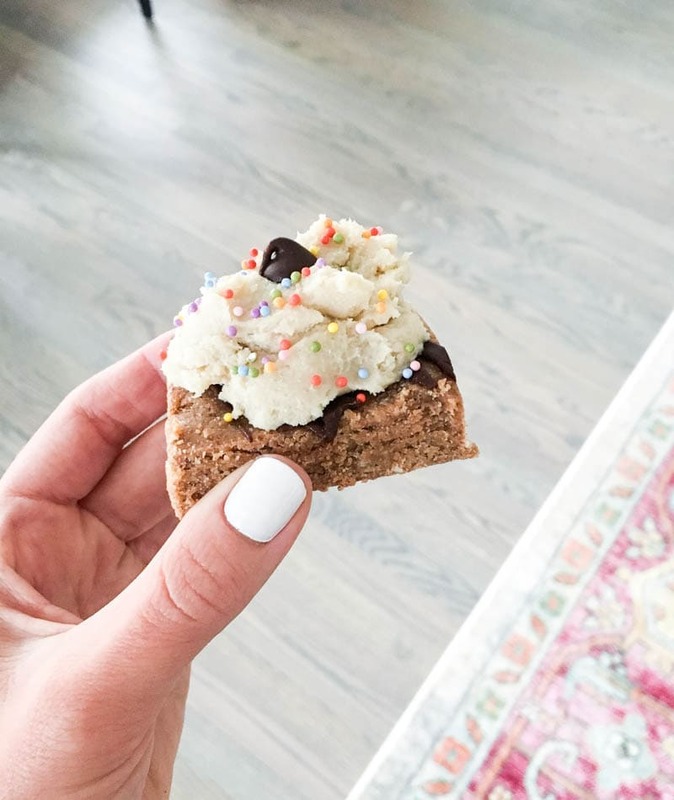 And afterwards, a vanilla version of my Quick No-Bake Chocolate Covered Protein Bars, with cashew cream on top, just because. 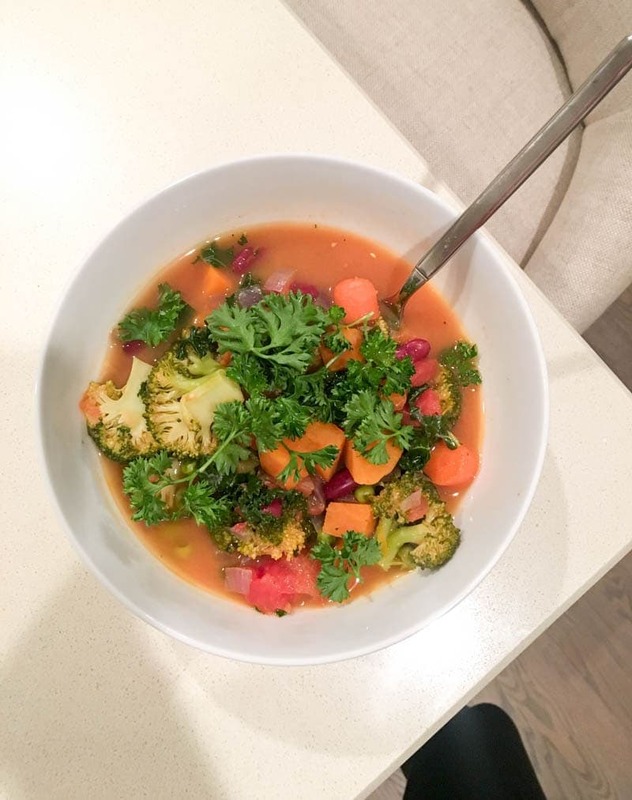 And lastly, a big bowl of my most popular blog recipe to date, the Cleansing Detox Soup! You can use whatever veggies you have on hand. It’s the spices and lemon-y flavor that make this soup so dang good!! I did add kidney beans and extra lemon. Mmmm. Followed by the best Taz snuggles on the couch. 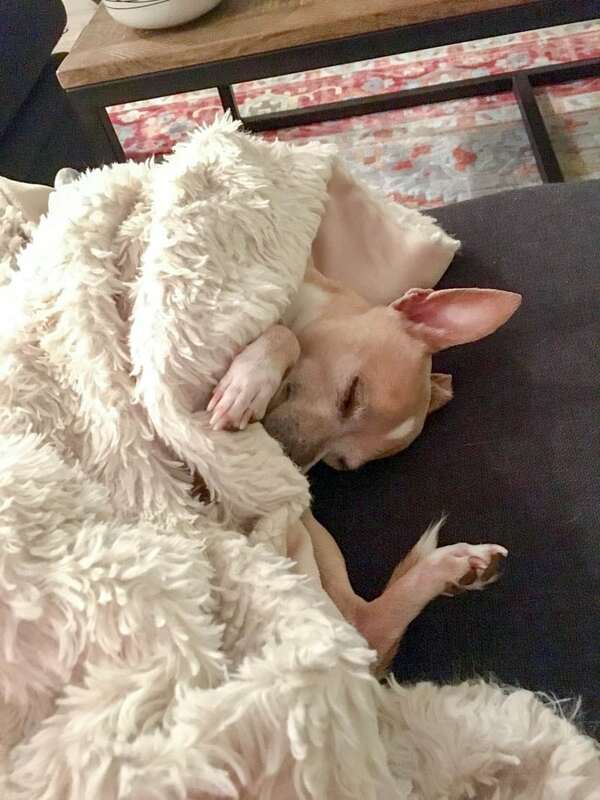 If he’s not under the covers in bed, he’s under a blanket somewhere else. TOO SWEET! Hope you guys enjoyed this week’s What I Ate Wednesday. Have a great rest of the week! Hi! I'm Shannon, a Certified Hormone Specialist and plant based blogger living in Chicago. I help women heal their bodies bodies from the inside out and balance their hormones naturally through a plant based diet and lifestyle. Let me guide you through it, so you can glow from within and feel the best you've ever felt! Want to know the best foods to eat for each phase of your menstrual cycle? 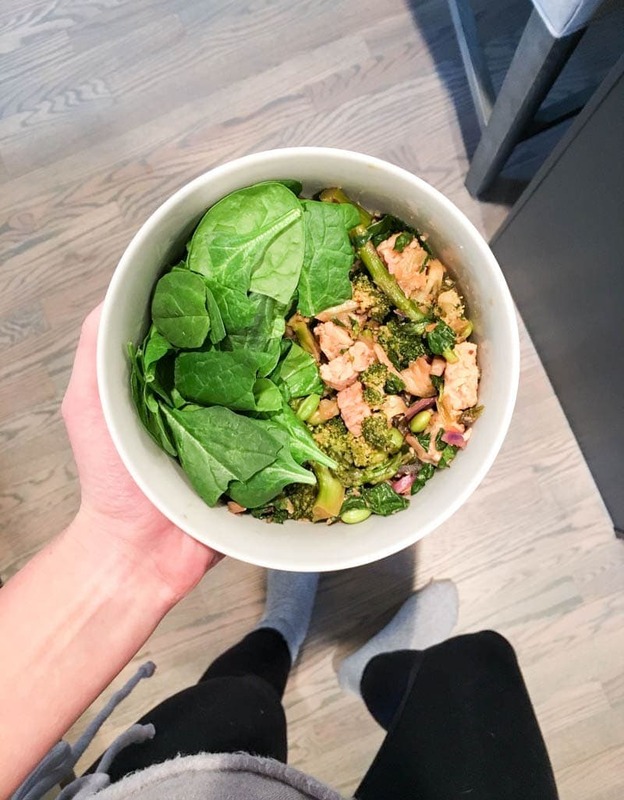 sign up to start eating in sync with your cycle!